There is no better app, and I’ve tried them all. I’ve been using this app for a over 7 years and have had zero problems. It has easily adapted to all types of flying I’ve done as well, from GA to 135 and 121. I can’t recommend it enough. If you’re a military pilot transitioning to the airlines: This program / app will only let you keep one log book, so if you’re applying to different airlines that treat military time differently, ie, Southwest vs American, you will have to redo your logbook to accommodate the different ways of totaling your hours. After engaging with Safelog customer service all I got was “Safelog doesn''t (sic) support creating multiple logbooks under the same account.” Try LogTen Pro instead. 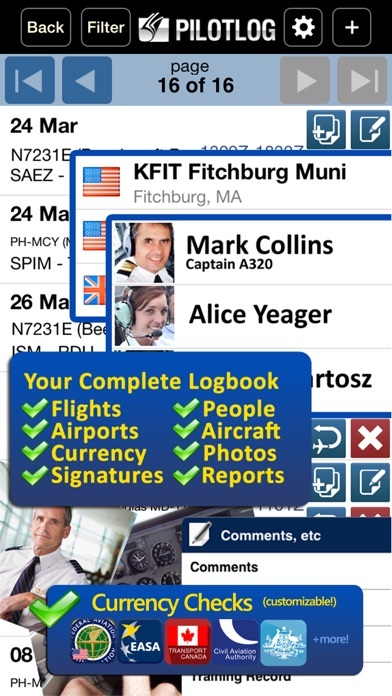 A good logbook app that runs smooth between MAC, Ipad and Iphone interfaces. The printing features are quite adequate. Some issues with overlapping data entry line, but the app certainly does not crash and runs stable on my interfaces. I made the switch from paper to Safelog a few years ago as a flight instructor, and even now as an airline pilot I’m happy to say it has served me perfectly through both phases of my career so far. There’s a bit of a learning curve to get it set up just right to your taste, but once you configure the seemingly endless options, this logbook’s power is really evident. As an instructor I was able to keep track of student names, special events/lesson tasks, in addition to any flight condition/aircraft configuration I could think of. The software even has a database of aircraft operators to display flight school & company logos in each line entry if you choose (a really beautiful touch). When I interviewed at my airline, I went armed with an extremely neat binder containing the printed safelog report that I was able to customize and generate directly from the web app (both a totaled cover sheet and the logbook itself). No messy writing, no extraneous info, and it took all of 30 second to compute each total I needed. I still use safelog every day I work and it’s just as home in a jet airline cockpit as it was in a 4-seat bugsmasher. I personally just throw in my flight number, the UTC block times straight from our ACARS screen, the approach I flew, handling role (PM/PF), plus all the other standard info (stuff like night time and landings are auto-filled) and I’m done in about 15 seconds. Overall just a great product by a solid company with great support. You can tell Dauntless really cares about their work and the latest UI update continues to improve the experience. Highly recommended, even over the more well-known competitors. KEEPS CRASHING. Please fix this ASAP. I am a student pilot and a railroad engineer. I use this logbook over the others I’ve tried because this one is all platforms. It does not matter what you use. iphone, android, home computer, public computer. Anything. The others limit you to some device. Logten for example is mac only. if i want to use a public computer to enter my flight i am unable. I keep track of both my flying an my railroad log. it is very customizable with text, time and number fields. Also you can print out your log book if you need a hard copy. plenty of options and a whole lot cheaper than the others. Don’t buy subscription renewal on the app. The app only offered me 1, 3, 5, and 10 year renewal. There is a lifetime which is $350 if you go to the website. However, the real kicker here was in the app the 10 year was $299.99 but on the website it was only $249.99...scheming hard for that $50.00! Hope this is an over-site. The product is sound and amazing. I’ve used the software for about 5 years now. I love being able to track my flights and all the reports generated are excellent. I am a civilian aviator but just switched over to military flying and SafeLog is able to accomodate both types of flying. Highly customizable and great features and updates. Customer for life! Just purchased this app and every third flight I enter the app seems to crash. This is proving to be a very frustrating purchase! I have a brand new iPad mini w/retina running iOS 8, please help! Finally, an online logbook that I can transition to. Being able to easily put in my current flight times convinced me to go with this app. The IPhone app paired with the web based logbook is easier to use than my old Jeppesen Professional paper logbook. I hv had it for 3 years. Terrible customer support. Sarcastic, Not a pilot Friendly team or app logic. I compared safelog with log ten pro and. Logbook pro. Both those apps call themselves "pro" but safelog is better on every way. For example, date entry is a snap, the it's airport database is complete, and I found out I can take photos with my iPhone cam and attach them to my flights and it all syncs with my pc! The best part is that it's actually much cheaper too. Log pro has a teaser app but their "sync account" price (you need it) is extortionate and log ten is similar. Safelog by contrast is up front and all told very reasonable. I had a question and they got back to me within minutes... On new years day! Amazing service! Nice, but needs better iPad support. iPhone version is great, but tons of wasted space on IPad. Overall, easy and simple to use! 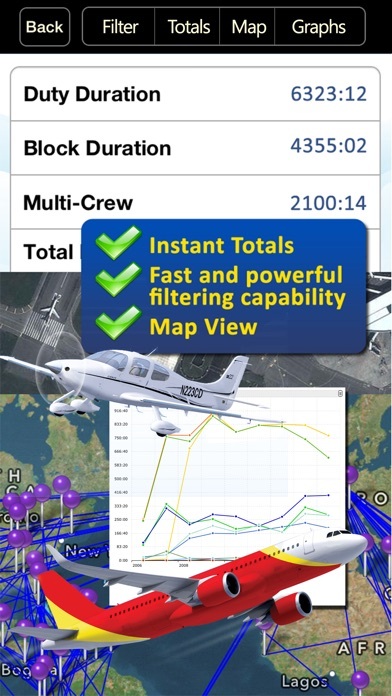 This is the most useful aviation app that I have, It is very user friendly with sync capabilities on your PC or web access. I have been a safelog customer for over five years. Started with the safelog for PC then transitioned to the web based program two years ago. I have never lost any data and the company is constantly making improvements and upgrades to the system. I manage three pilots who all use safelog as well as this app. We have customized the safelog to capture the type of flights and how many flight hours are spent on each flight. I suggested safelog add the ability to track Hobbs as well as tach time. They were prompt to reply and are in the process of adding this feature. DON'T BUY THIS APP IF YOU ARE NOT ALREADY A SAFELOG CUSTOMER. IT IS NOT A STANDALONE PILOT LOG BOOK. After examining many logbook products, we chose safe log since the product actuallly does and costs what it promises. With others, we found pretty screenshots and marketing hype obscure a basic lack of flexibility. Not with safe log! We use it in our flight school and appreciate the deep feature set and ease of use. We particularly like the ability for our instructors to see student log books remotely (with the students permission, of course)! Tried to load the demo, 2 hours and I'm still waiting. Is this a sign of things to come if I purchase the full version? Used it for many years now. Fly all over the world, and have never had an issue imputing airports. The nice part, it can simple or complex- and you get to decide it. Will never go back to paper.. If you are an experienced pilot like me, or an up and coming pilot looking for a new approach to a logbook, you will not be disappointed... worth ever cent.. Outstanding improvements, excellent app. Dauntless software listens to their customers and are willing to improve their already superb line of products and this app is no exception. There are some things we as customers wanted to see added to the 1st release and the improvements are here in the second release. You do not have to be a large company to speak with them or get results. 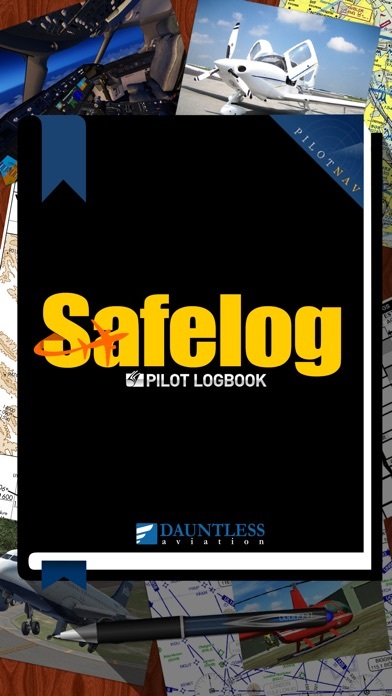 This companion to their Safelog PC software is the perfect logbook on the go. When I am done with a flight, it takes only a minute or two to add it to the logbook....hit 'Synchronize' and I'm done. Awesome! Safelog is, quite simply, the best. I have tried all the logbooks out there. Safelog far far far outshines the others at every level, including their wonderful and professional support team. I use this app after every flight and could bit be more pleased. The app is great! Negative side, customer support is hard to reach. Cannot find how to change personal info (address, phone, email...) for the account online or even email them. As far as the app, this new update is terrible, cannot enter IFR or night time! Needs a new update so we can enter those times again! Great logbook!!! I switched from another older logbook program because of the ease, usability, and open format. I like the licensing agreement better than purchasing software too. So far it's great! I've been looking for a good, reasonably priced pilot log book software for over 5 years. This is very easy to setup and use, very readable and unbeatable in price for value. Customer service is better than any I've experienced. I needed to have a 10 year old Captain's Log 2000 e-file converted. The file was converted in less than an hour, but a gentleman (Steve) at Dauntless, noticed it wasn't quite right and initiated a call to me to fix the issue. That's very rare and greatly appreciated. He worked with me, on the phone, for about an hour to resolve the issues completely. Captain's Log has a weird data base. I'm very pleased with the application and the customer service. Highly recommend this. Garbage app that does not stand alone. Waste of money! After using the web-based Safelog program, I decided it was worth the $40 for this app. It breaks down every minute of flight time with great detail and accuracy. So far, I'm very impressed ! This is the most thorough logbook program out there and I'm very confident with it's security. Great job, Dauntless! Awful company and awful app. This app is prone to crashing right after reboot and I was forced to just use my desktop to log my hours. If it does crash no amount of delete and reinstall could fix it. Believe me I tried. Dauntless can't be called and have no tech support except for an email address that will take them weeks to respond to. At the end of your subscription they'll send you emails threatening to delete your account unless you give them $44.00 to renew for another year. I've never run into any company that treats their customers like crap as much as dauntless does. Just wanted to throw a one-star in there for Dauntless’s baffling customer service strategy. I’ve communicated with them on multiple occasions in the past and the rude, sarcastic responses leave you wondering. This company must spend quite a bit on fake positive AppStore reviews, because I can’t imagine any real customer has has had a good customer service experience. Always looking out for “Steve” at GA events, but have yet to meet the man in person. Unless you hit the more information tab, you would never know this app requires a yearly fee in addition to the high cost of the app for just a log book. They have no customer service phone number and will not respond to my emails. If you have money to burn and don't require app support this app maybe for you.Otherwise, I would keep looking. I've used this app for over 4 years and its worked great. I really like the products dauntless software has produced and they have helped me from my Instrument, Commercial, ATP, and now CFI. The logbook keeps a great record of my flights, and prints a smart looking logbook. The new version crashes when I try to filter my logbook though. Its only slightly annoying now, but they need an update to fix the crashes. A couple of months ago I decided to finally buckle down and convert all my paper log books to electronic format. What I wanted was a simple solution that would let me view my flight data from my computer, iPhone, iPad, or a web browser. A cursory (too cursory) search of available programs led me to buying Logbook Pro, along with their sync service for Web and electronic devices. What I did not realize is that when Logbook Pro says they "Synchronize" data, they mean you can enter flights on your iPhone and submit them to your PC - and you can also get back very basic summary information and canned reports - but you do NOT have your actual flight data on your device. This seems so ridiculous that I did not even consider the possibility that their "synchronized" iPhone app wouldn't have my actual flights on it - I just took that as a given. Caveat emptor, I didn't read the fine print so I wasted a lot of money. After doing some more research, I found SafeLog. With SafeLog, SafeLogWeb.com, and the iPhone/iPad app I get TRUE synchronization. I can view, filter, and edit my logbook information from ANYWHERE - not just my PC. The sync process works very smoothly, and Dauntless even provided a FREE conversion service for my Logbook Pro data file. The service & support from Dauntless has been outstanding. If you want to have access to your data from anywhere, don't make the mistake I did in buying Logbook Pro. SafeLog is FAR superior with their iPhone/iPad/Web access, and for my purposes (PP-ASEL-Instrument) I have found no part of the program at all that is not equivalent or superior to Logbook Pro. That's not to say there isn't room for improvement, of course. The iPad is treated like a big iPhone, so all flight data is there but the larger screen isn't utilized well. Compared to Logbook Pro it's still a huge improvement, but could be better. If I'm connected, I usually just go to safelogweb.com to get the full view - but I'm told that full "logbook view" is coming to the iPad app "Soon", so I'm looking forward to that. This app and even the computer software is very unstable. Will shut down on its own periodically. App will take 3-4 minutes just to open and up to 5-10 minutes to sync on reliable internet source. Waste of money in my opinion, I will be getting a different program. Don't waste your hard earned money on this super expensive app. You're better off just using a free excel spreadsheet. The so called James (RC plane pilot, Desk Pilot) is the most overbearing disrespectful bully customer service person I've seen in my life. I guess he is his own boss and does not care to help the paying customer and instead just bullies them. Don't waste your money. This one man company is not deserving of it. It's simply the best logbook and the best value on the market. Searched all over the Internet - no way to find better one then this! Yes , it's a bit costly , but worth it! I have been a long time SafeLog customer. This app is a great add on to your SafeLog or SafeLogWeb account. It is easy to use and runs great on my iPad 3. The customer support and web help is great. The team is very responsive to new ideas or bug reports. I am a commercial pilot and fly around 400 to 500 hours per year. With WiFi or 4G I log my flight right from the cockpit. If I am at my PC the flights sync right down. I really like the desktop version...until I bought the iPad version. I primarily use the desktop version for reports and printing. Keep up the good work guys. So glad that I shifted from paper logs. App is very helpful and syncs with the web, so I can log and analyze in both places. And, I now don't have to fear LOSING my logbook and not having a backup! I downloaded the app and set the demo account successfully. I am currently using logtenpro and thinking about dumping them since their ipad reports are limited and don't print the approaches and the FAA examiner did not accept them. They promised a fix over a month ago but they want me to pay full price for the mac version that claims reports can be customized. I am trying Safelog and although the log shows the airport/type of approach (RNAV, GPS, VOR,ILS) in the comment column and ability to customize the columns, so far the report prints the airports but not the type of approach. Their app is free, however it is slow when creating the reports and require a yearly fee for using their servers to synch data across platforms, a little pricey considering that many clouds provide 5Gb of space free. Tough decision: pay one time $99 logten for mac to try their custom report or three years of safelog subscription if I find how to print the approach types. Nice app. Very handy to keep flight times updated, and totalled. Why only 2? For the price, I would expect a standalone app - this one needs a subscription to the PC or Web-based products. For the price, I would expect customization - this one has a fixed display. You can collect a wealth of details about each flight (fuel injected? controllable pitch prop?) but there is no way I can determine to produce reports with all that stuff. Yes, there are multiple printable reports, but all variations on the basic log book theme. For the price, I would expect 0 defects. It crashes just about every time I use it (ipad and iphone version), such as when I try to go to a specific date. I have tried about 3 different logbook apps and this is by far the most complete and easier to use. Any problem you might run into, customer service solves it right away. In my case I live in Chile and some of our most obscure airports were not in the database. I contacted customer support through the web expecting the usual inefficiency, and to my surprise their database was updated within hours of my request. The App is continuosly being improved. I love the map function which allows you to see on a map where you have been flying to. 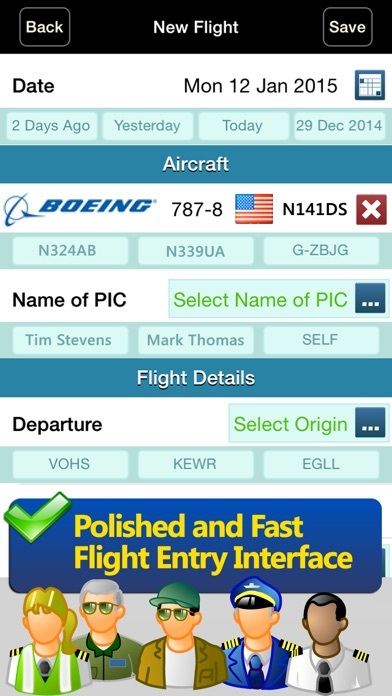 Stop your search, this is definitely the best App for pilots, both professional or not. I started flying when I was young and became worried about what I would do if I lost my logbook. I looked for a long time and found safe log I have there PC based logbook and it is very nice to have for turning your hours for insurance or knowing your hours aren't lost if you loose your hard book. I just started using the app and it is so nice having all your flights at your finger tips. I can update my logbook through the app right after my flight that way I don't forget anything. I recommend this program for everyone. Safelog has been my trusted logbook for years. It is a shame that this superb app's rating has been lowered because some yahoos didn't read the description (should those guys really be in an airplane?) All told, Safelog is cheaper and better than the rest. I've been a safelog user for over 4 years and while the mobile user-interface was always somewhat clunky it at least worked. The current update adds more steps to quickly logging flights, the app crashes every couple of minutes and it's completely unresponsive at times... I'm moving on to the competition. Do not update! This thing does it all. Recommend this app to another pilot and he still gives me thanks after 2 years of him using it. That's all that needs to be said. With the screen real estate available on the iPad I was really surprised to find that this app lacks anything resembling a regular logbook layout. Otherwise it is very handy for adding flights to your online database. It would definitely be a four or five star app for me if it had a standard logbook view, without it, 40 bucks seems a little steep.